This is one of London's best kept garden secrets. Description: To the north-west of what remains of Holland House stands an unexpected Japanese garden, sometimes inhabited by beautiful white peacocks. 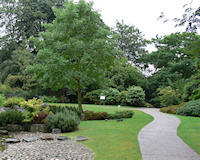 The Kyoto Garden, opened during the Japan Festival in 1991, was designed and built by the Kyoto Garden Association and sponsored by the Kyoto Chamber of Commerce and Industry.